The coop multiplayer (survival mode) is a type of online game mode that allows a maximum of 3 players to get together and fight against waves and waves of mutants. One can play with random players worldwide or with their Game Center friends. One may also do it solo by tapping "join friends", "new game" and then "start now". The coop multiplayer features a scoreboard to allow players to compare with each other. 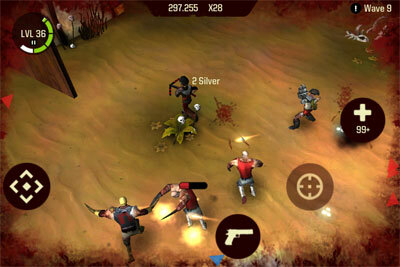 The players can score when they kill a mutant and the score can be greatly increased by having a high team multiplier. The mutants drop loot as usual but every player in coop multiplayer receives the same amount of silver, crystals and boosts so they do not have to compete with each other for the loot. There are altogether 21 waves in coop multiplayer and mutants of all levels of difficulty are present. Some mutant champions may also appear at the end of a wave. The coop maps generally consist of a wide circular track with mutant spawn points on the sides. This type of game mode requires a lot of cooperation and skills, as well as good gear. If one can survive till the later waves of the game, they can earn a lot of silver and crystals. There are a few waves where a particular type of mutant is featured. Wave 5 features wasps, wave 10 features melee mutants, while waves 15 to 21 feature (in order) ranged mutants, spiders, artillery mutants, crocodylians, contaminators and drill-mechs. To survive in coop multiplayer, make sure to know how to run and gun because this is essential in the later waves of the game. Heal yourself and your teammates so as to reduce the need of reviving. Watch out for multiple shamans. They can be very tricky. Remember to keep moving, someone standing and firing is sitting duck, and doomed to be swarmed. Having high health and defense can save you, but it is far better never to get hit. There is a general set of rules for each type of mutants, but they all have one thing in common - do not lay your guard down simply because you believe that you are safe. That is when the mutants would catch you by surprise. Always focus on wasps first. There can be 20 or more lurkers following you, but if you get hit by that wasp, it is all for naught, ruining your team multiplier. In the later waves, when you kill a mutant, it is likely to be replaced by another one from a random doorway. If the mutant should emerge somewhere in front of you, pay attention to that specific mutant blocking your path, before you fire into the throng behind you again. When you see mutants entering from multiple directions at the same time, and you can foresee that you may get swarmed, it is time to plan your escape. Do not try to fire into their midst and risk getting swarmed. Find the path with the least number of mutants that block your path, and keep running until all the mutants are far behind you. If unfortunately you get swarmed, there are still a couple of ways to survive. Since the multiplier decreases for every hit you take, it is best to use shockwaves or speed boosts to run away from the mutants. Using a lot of defense boosts or medipacks to stay alive within the group mutants is never a good way to play as score is concerned. It is good to have one of your weapons tailored for crowd control. This can be any weapon with an area of effect, like crossbows, flamers or RPGs, with lot of poison add-ons attached. You can make the most of it by saving your buddies who are about to get swarmed, and slowing down the contaminators and other mutants to get them out of their reach. Using weapons with an area of effect can also increase the pace of the game significantly, reducing the time needed to complete the coop multiplayer. One example of such usage is to rush doors when the mutants spawn from the sides, effectively eliminating a large number of mutants before they can start their attack. Each time you and your teammates kill a mutant, your team would receive a score based on the type of the mutant, the level of the mutant and the team multiplier. The following lists the base scores of different mutants, which are the scores of level 1 mutants. Level 2 and level 3 mutants are worth 2 times and 4 times of the base score respectively. The mutant champions have their own set of scores. A score analysis which involves a total mutant count (download spreadsheet) reveals that the perfect score (theoretical maximum) of coop multiplayer is 14,586,513. I have been a fan since I got my iPad2 and I must say, the game is addictive and I am loving it. A friend of mine bought an iPad2 and we have been playing co-op up u till two weeks ago when we started having problems. reset my iPad, removed my progress on the game and started from scratch yet still the same. I am using an iPad2 3G 16 gig and so as he. I just tried using an iPhone 4s to play with him and I am getting Especially if we on separate network. I have consulted with other players on forums like "Touch Arcade" yet it seems like a losing battle as some of the players have accepted and decided to live with such problems which Oslo include getting disconnected when reaching wave 20 etc. Hi, thanks for the reply. Your answer is actually make sense. I never try to invite, but usually i try to match my time with the, and only find that one player which has started to play. okay next time i will try to invite them. Thank you for your suggestion. But that would require like sending emails to the players which may cause problems since we do not want to spam our users here. But we would try to think of a better way to do so. Have you tried sending invitations to the players on the list when you launch the game? The playtime tells you when the particular player would be available for a game. Maybe have a page where player can make appointment on when to play. I have been playing bullet time for a long time and never never play coop multi with other player, let alone death match. I can't find any games there. So i google2 and found this website. Nice! I thought i will be able to play with others if I add everyone from here. It's been 2 weeks since I join this website, and I still can't find any game from game center.